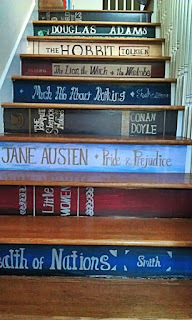 Coolest staircase ever! I will do this one day! I found this on Pinterest. I joined goodreads.com last March, right around the time I began blogging. If you love to read and you are not a member, I highly recommend checking it out! 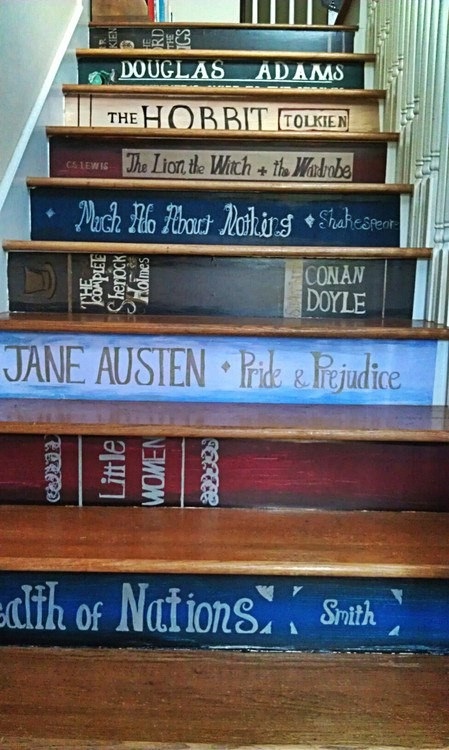 It is a whole online community for book lovers! What could be better? Plus, there are several authors on the site so you can follow them and see what they read. I have found some good books by following the readings and recommendations of a favorite author of mine, Tamora Pierce. In March of last year, I set a goal to read 20 books by the end of the year. If you come to my blog and look around, you probably noticed my little widget on the right noting my progress. If you click there you can get to my goodreads profile and the books that I have read towards that goal. Last year in about 10 months I exceeded my goal by 13 books. I do tend to read a lot of young adult books, however (and 3 were audio books which I have mixed feelings about posting... but I did not post the other 4 audio books I got through last year so I guess I'm even?). These are far below my reading level, but they are what I enjoy the most. Life is too short to read crappy books. This does tend to raise my book count. Keeping that in mind, I set my new goal for 45 books to read by December 31, 2013. Think I can do it? I hope so. Feel free to keep up with my progress and my books. Make goals for yourself. I always encourage reading and there are oh so many good books out there. If you add me as a friend, I can see what you have read and liked. Lots of my friends' books that rate high end up on my "to read" shelf. Plus as you read and rate books, goodreads will make recommendations. Awesome. My recommendation from 2012 for people who enjoy young adult books: read Rick Riordan! I have been raving about the Percy Jackson books. I am accepting converts *wink*. Love 'em. Labels: book lovers, books, goodreads.com, reading goals, what should I read next?